So you saying flip the pump ring?? Yes, I know that it works on the stock replacement P/S pumps. Many re-mans that are listed for the Turbo Buicks are assembled for standard rotation. Flipping the cam ring over (as mentioned in the assembly guide) fixes the issue. I'm not sure on the Type-II pumps as I've never had one apart. But if it modeled after the TC series, then it should work. well me and 87NATIONAL have pulled it apart and i flipped the ring over reassembled the pump and installed it, still the same. i may have pulled a stoner moment possibly and put it back together without flipping the ring lol, i am going to take it back apart and see if i did. but it seems simple inside the pump and i want to know what a stock pump looks like inside and what makes it CCW rotation, i could of put the rotor in upside down also..... such a headache. The pump ring should have some sort of mark on it for assembly purpose. I've done pumps (not TB) which had a rotation direction arrow marked on the outside area of the ring. As shown above and in the image I posted, the TB pumps have marks (like dimples) on the end of the ring. 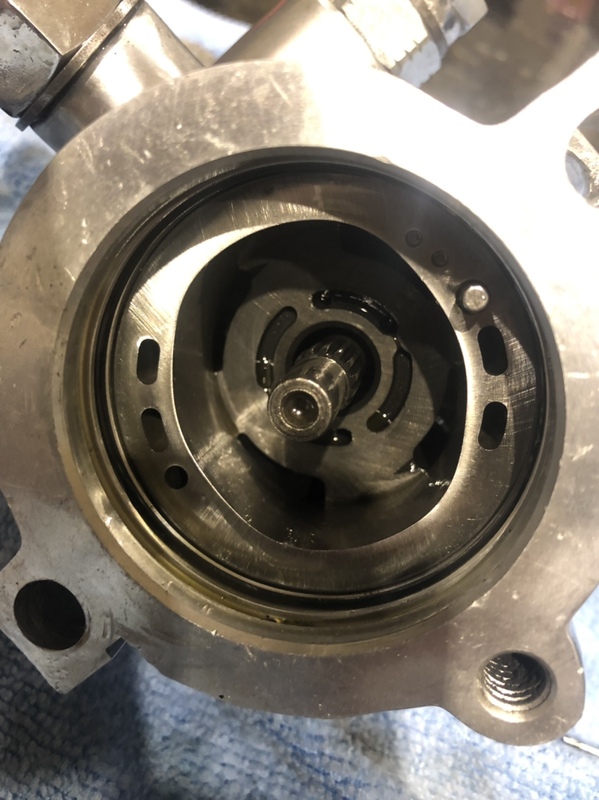 Note the wording for the pump ring position in the above image, "Identification marks on pump ring face upward except turbo V6 and Grand National (marks face down)." This is what defines whether the pump is standard or reverse rotation. Can you take a picture of the inside of the pump and post it? No, the oil cooler for the power steering pump. Oh, I have it mounted to the front of the condenser with push thru zipties. Can’t see it now sorry. I have the lines routed around the driver side header panel. Ive taken them apart to clean but haven’t gotten them to last long. I’m guessing you have gotten the Gates seal kit for the pump. I called PSC they said they had one more left but are not doing the pumps anymore but it was $300 and they would not warrantee the pump. That’s why I went with Lee and it was only $160 for the rebuild plus shipping. Well that doesn't make sense. In the picture above can see the two dimples in the upper right. This would be a standard rotation setup. Does the other side of the pump ring also have dimples? If so then my guess is that the machining of the pump ring changed. And doesn't allow for reverse rotation. But if the other side of the ring doesn't have the dimples, it may be as you said a stuck pressure control valve. Or, possibly that the hoses are switched at the steering box? The one closest to the engine is the feed line. that was 87NATIONAL's pump, i have mine flipped with the dimple marks down (facing toward the drive shaft), all seems correct, guess ill try the stuck valve and after that im going back stock rubber hose and reman pump. never had the hoses off the gear box and im pretty sure they are hooked up correctly, steering and brakes worked fine before this leaking pump issue. That’s why I went with Lee and it was only $160 for the rebuild plus shipping. lee can build the correct pump and have it fitted for 160? i was told a price way higher than that. who did you speak to there?